GST popularly known as Goods and Service Tax is a major step towards the country’s economic reform and a multi-stage destination-based tax that will be levied on every valued addition. GST remarked as “Good and Simple Tax” by our Prime Minister Narendra Modi is the India’s most ambitious tax reform since independence launched by BJP government at the stroke of midnight of Friday (30th June) which is going to applicable from 1st July, 2017 in all over India. The Government has opted for 4 broad slabs for both Goods & Services – 5%, 12%, 18% and 28% apart from several items faces Zero levy. 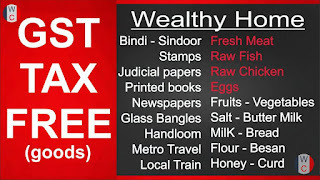 Food items such as milk, eggs, meat, fish, chicken, curd, honey, fruits, vegetables, flour, besan, bread, all kinds of salt, jiggery and hulled cereal grains have been keep out of the taxation system. 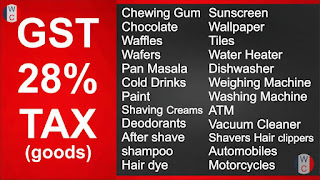 Sindoor, bindi, kajal, palmyra, human hair and bangles do not attract tax. 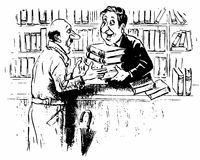 Newspapers, printed books, judicial papers, stamps and drawing books also comes under this category. Others include Jute, Handloom, Metro travel and local train will not have influence of GST. Items like apparels or footwear below Rs. 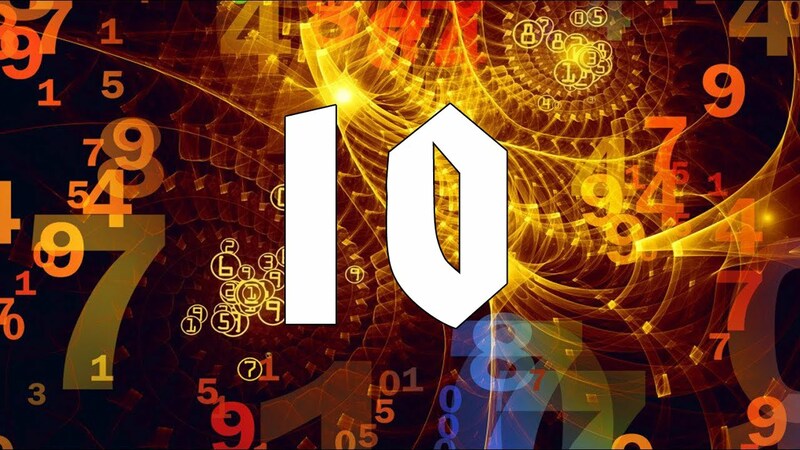 1000/-; Fuel categories such as biogas, kerosene, coal; Health Industry products like medicine, Insulin; Transport services like railways, air travel and small restaurants are under this category. 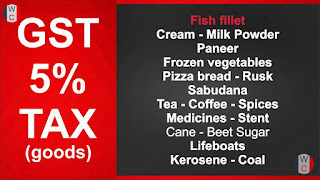 Food products like fish fillet, packaged food items, creams, skimmed milk powder, branded paneer, frozen vegetables, coffee, tea, spices, pizza bread, rusk, sabudana, cashew nut, raisin, spices, ice and snow will be priced at 5 percent tax. Others under this slab are agarbatti, kites, postage or revenue stamps, first-day covers and lifeboats. Utility items like tooth powder, umbrella, sewing machine, spectacles, indoor game items like playing cards, chess board, carom board, ludo, apparel above Rs. 1000 and Mobile phones are under this slab. Edibles like frozen meat products, butter, cheese, ghee, dry fruits, animal fat, sausage, fruit juices, namkeen, ketchup & sauces will attract 12 percent tax. Cutlery items like spoons, forks, ladles, skimmers, cake servers, knives are fall under this category. Ayurvedic medicines and all diagnostic kits and reagents are 12% taxed. 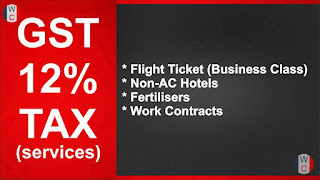 Services like Non-AC hotels, business class air ticket, state-run lottery, fertilizers, and work contracts will fall under 12 % GST tax slab. Items like printed circuits, camera, speakers, monitors, printers, electrical transformer, CCTV, optical fiber, envelops, bidi leaves, sanitary napkins, note books, steel products, pencil sticks, aluminium foil, weighing machinery, bamboo furniture, swimming pools, head gear, footwear (costing more than Rs. 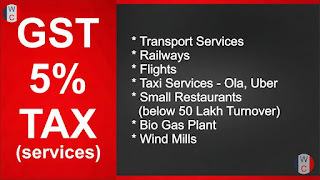 500/-) are fall under 18% tax slab. 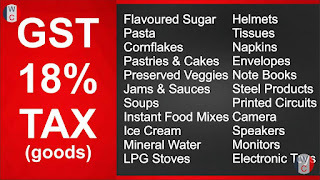 Consumables like biscuits, pasta, cornflakes, pasteries, cakes, preserved vegetables, jams, sauces, soups, ice cream, instant food mixes, curry paste, mayonnaise, salad dressings, mixed condiments and mineral water are 18% taxed. 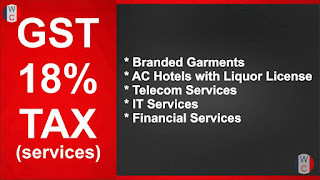 Services like AC hotels, liquor, telecom, IT sector, branded garments, and financial services attract 18% tax under GST. Personal care items like deodorants, shaving creams, after shave, hair shampoo, dye, sunscreen, bidi, paint, wallpaper, ceramic tiles, water heater, dishwasher, washing machine, ATM, vending machines, vacuum cleaner, Automobiles, motocycles, aircraft, shavers and hair clippers are under this category. Edibles include chewing gum, molasses, chocolate, wafers, pan masala and aerated water. 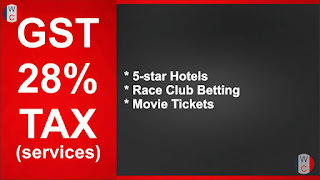 Services like 5-star hotels, race club betting, private lottery and movie tickets are 28% taxed.